-Deductive and Inductive reasoning are both based on facts, or evidence. -Inductive reasoning begins with specific facts and concludes with generalizations. -Deductive reasoning begins with a premise that is valid to reinforce or develop a right and official conclusion. Hey guys, welcome to this video over inductive and deductive reasoning. 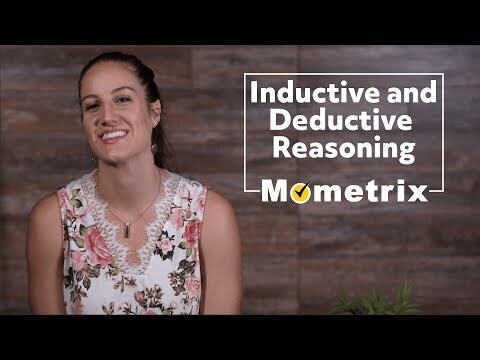 Inductive and deductive reasoning often times get mistaken for one another, but the differences are pretty crucial to understand. One type of reasoning guarantees a right conclusion, and the other type gives you a “well most likely” kind of answer. Part of the reason these two types of reasonings get confused is, because a lot of us will have used the type of reasoning that gives us the “well most likely” conclusion but try and pass it off as a guaranteed right conclusion. There are multiple problems with doing this, but one of the problems with doing this is that it has seemed to muddy the right understanding and use of these two reasonings. So, let’s define each reasoning, and look at some examples. First, deductive reasoning. Deductive reasoning begins with a premise that is valid to reinforce or develop a right and official conclusion. When working out math problems you are using deductive reasoning. Frogs are a living organism. Therefore, frogs need water to survive. You can see, in each of these examples, the conclusion is built on an objectively true premise, and minor premise. Deductive reasoning is commonly referred to as top-down logical, and this name helps to give us a really helpful, I think at least, visual of how deductive reasoning works. So, you have a pyramid. You start with a general truth. Which is at the bottom of the pyramid. Then, you move to a premise that fits within that general truth, but is a little more specific. Maybe you want to include another true premise that fits within the general truth. Lastly, you end with your conclusion. It may be helpful to think if it as beginning with generalities, and ending with a very specific conclusion. When using deductive reasoning your conclusion is guaranteed to be true as long as your premises are also true. For example, when you have specific data, and you move to make a general conclusion based on that specific data. You’re a soccer player and you’re tall, therefore all soccer players must be tall. All of my brothers are athletic, therefore all boys are athletic. You can see in each of these examples how, it starts out very specific, and moves to a generality. Inductive reasoning is commonly referred to as bottom-up reasoning, because it starts out trying to prove a specific conclusion from the get-go. So, let’s look at our triangle again, except this time we start from the top and work our way to the bottom. Inductive reasoning will start with a conclusion. Then, move to a specific instance. Perhaps, a second specific instance will be provided. Finally, a generalization is made from the specific instances. When using inductive reasoning you are, at best, guaranteed a probable conclusion. I hope that this video over inductive and deductive reasoning helped to clear up any confusion. If you enjoyed this video, then be sure to hit the like button, and subscribe to our channel for further videos.